Fun, fun, fun, and all about Jesus – we teach the Bible to our children in fun and exciting ways, encouraging them to live life to the full for God. We want our kids to enjoy their church experience and to know that God is fun, creative, and loves them. Our goal is to provide a safe, clean, and loving environment for your baby as he or she experiences love and hope at church. Those serving in this ministry actively pray and care for the children during their time together. 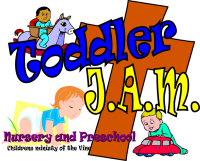 The preschoolers are divided into classroom by age, and their time includes age-appropriate Bible stories and activities. Snacks are provided for the kids.